Cpl. Euel L. Hawkins, son of Mrs. Lona Hawkins, Entered Army in Sept, 1943, trained in Camp Gruber, Okla., and Camp Phillip, Kan.; served in France and England; was killed in action in France in July, 1944. Awarded the Purple Heart, ETO Ribbon, Combat Inf. Badge. 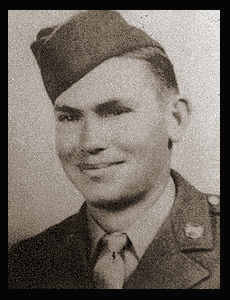 Eual Lee Hawkins was killed July 18, 1944 in Normandy and is listed in Memoriam page. Date of death submitted by nephew, Vance Hawkins.